Delia Ephron: "If you don't make time to read, your brain will rot." Norman Lear: "I read when I should be looking at television." Annabelle Gurwitch: "I like to pick up a book at my local neighborhood bookstore because I like a random encounter." David Milgrim: "Everything we hold dear is in books, and all you gotta do is pick them up. It's all there." As part of National Readathon Day--when book lovers are asked to pledge to read for four hours starting at noon in their respective time zones--nearly 200 bookstores, libraries, schools, universities and other organizations are hosting events. For example, at WORD bookstore in Brooklyn, N.Y., participants are invited to "grab a seat in the basement and a donut and get in some quality reading time" while at WORD's Jersey City, N.J., store, "the cafe will be reserved for readers from noon to 4 p.m. (no laptops allowed!)." BookPeople, Austin, Tex., is reserving "our quiet, peaceful third floor space... for anyone who wants to sit down and read from 12 p.m. to 4 p.m." At the Bookshelf, Thomaston, Ga., volunteers will read aloud Wonder by R.J. Palacio in the children's section, and the store will donate 10% of all sales between noon and 4 p.m. to the National Book Foundation. And at Watermark Books and Café, Wichita, Kans., the store will "keep things quiet" between noon and 4 p.m. so readers can "curl up with your favorite book" and "enjoy reading in a community of readers." An important component of National Readathon Day is fundraising to support the National Book Foundation's efforts to create, promote and sustain a lifelong love of reading in the U.S. Proceeds will go to Foundation education programs like BookUp, the after-school reading program that has given away more than 25,000 books to middle schoolers since 2007. So far, teams and individuals have raised more than $25,000. 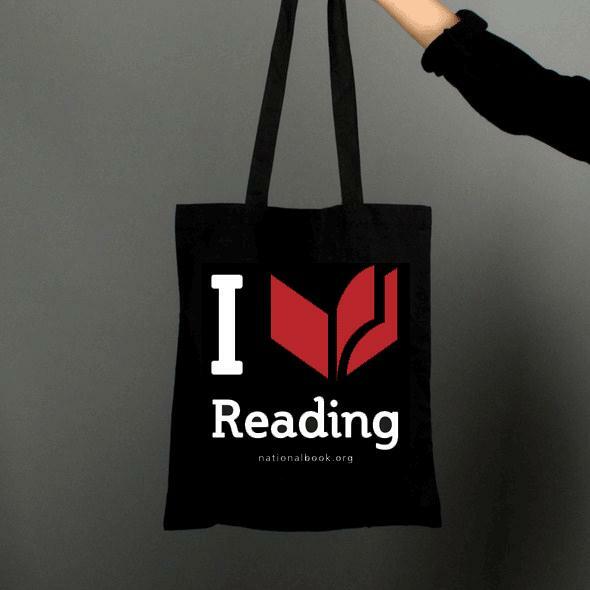 The National Book Foundation is providing some prizes for fundraisers: for $100 raised, an I Love Reading tote bag; for $250 raised, a copy of a 2014 National Book Award–winning book; $1,000, an I Love Reading tote bag and all four 2014 National Book Award–winning books; $2,500, two tickets to the 2015 National Book Awards ceremony, dinner and after-party; and for $7,500 raised, two tickets to the 2015 National Book Awards ceremony, dinner and after-party as well as hotel and airfare. In the first 10 months of the year, total net book sales rose 5.5%, to $13.2 billion, compared to the first 10 months of 2013, representing sales of 1,209 publishers and distributed clients as reported to the Association of American Publishers. Net book sales in October jumped 11.9%, to $1.03 billion. A nearly 250% gain in higher ed course materials accounted for most of the gain; children's/YA books rose 16.5%, professional books rose 13.5%, adult books were up 10.9% and university presses gained 8.9%. Among highlights for the year to date: children's/YA continued to grow, with sales up 21.6%, to $1.5 billion, and K-12 instructional materials have gained 12.1%, to $3.2 billion. Last week, Michigan Governor Rick Snyder signed a "Main Street Fairness" bill the legislature had passed at the end of December, the Detroit Free Press reported. It requires large online retailers with a physical presence in the state to collect and remit the 6% sales tax, beginning October 1. The legislation is expected to generate about $60 million a year. "Local brick-and-mortar businesses drive our economy and without implementing this fix, they will continue to serve as showrooms for online retailers," Snyder said. The future location of Read It & Eat. Esther Dairiam is opening a culinary-themed bookstore in the Lincoln Park area of Chicago in April, the Chicago Tribune reported. Read It & Eat will sell cookbooks and other books related to food--food history, food science, travel books, novels and reference--as well as offer classes and demonstrations and "other food-themed events." A sales and marketing consultant, Dairiam has never been a bookseller but always loved cookbooks. She was inspired to open the store, she said, during a 2012 trip to Paris led by the resident chef of the Alliance Française in Chicago who took the group to Librairie Gourmande, a culinary bookstore. All the store's events will be linked to books in stock. "For me, it is all about the book," Dairiam said. "The book tells the story." 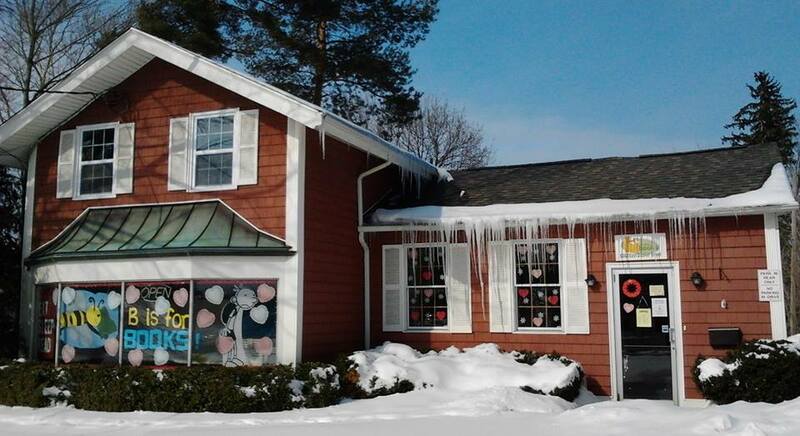 B Is for Books, the Orchard Park, N.Y., children's bookstore, is closing this spring, the Buffalo News reported. Owner Jane Bell told the paper: "Despite being a labor of love, and having the best staff in the world, running the bookstore is a lot of work. I have decided to close so that I will have more time to spend with my husband and our four children." Besides books, the store has sold bookends, bookmarks, educational toys and games, has a dedicated birthday party room and has hosted summer camps. 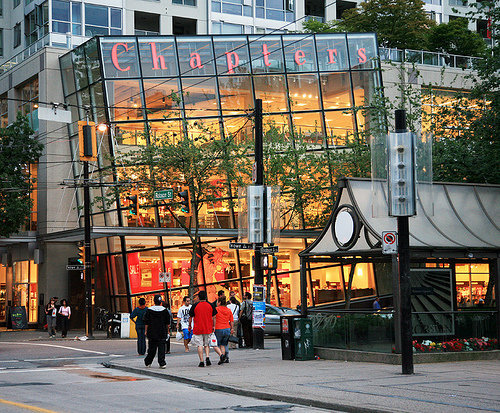 Indigo is closing its flagship Chapters store in downtown Vancouver, B.C., on June 30 because "recently a very significant rent increase made continued profitability untenable," the company said. Indigo added that it plans to open another location in the same area this year. The company will continue to operate its Chapters location in Granville and is temporarily moving its American Girl Specialty Boutique. Stuart Gersen, co-owner of Longfellow Books, Portland, Maine, died on Saturday of lung cancer. He was 64. As an obituary notice in the Portland Press-Herald said, Gersen was "a beloved member of the Portland community, running Longfellow Books with his friend and business partner Chris Bowe since 2001. Stuart was a strong supporter of 'keeping Portland independent' and was one of the founding members of Portland's Buy Local organization where he sat on the board until his battle with cancer interfered. 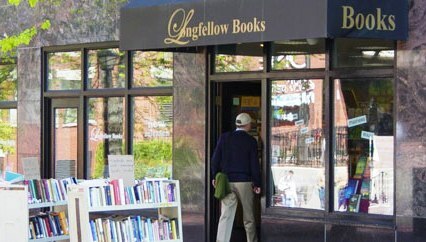 Stuart has been advocating for authors and readers for most of his adult life and was honored to be a part of the community created over the years at Longfellow Books. He will be missed by his family, friends, and the community of book lovers in Maine and elsewhere." 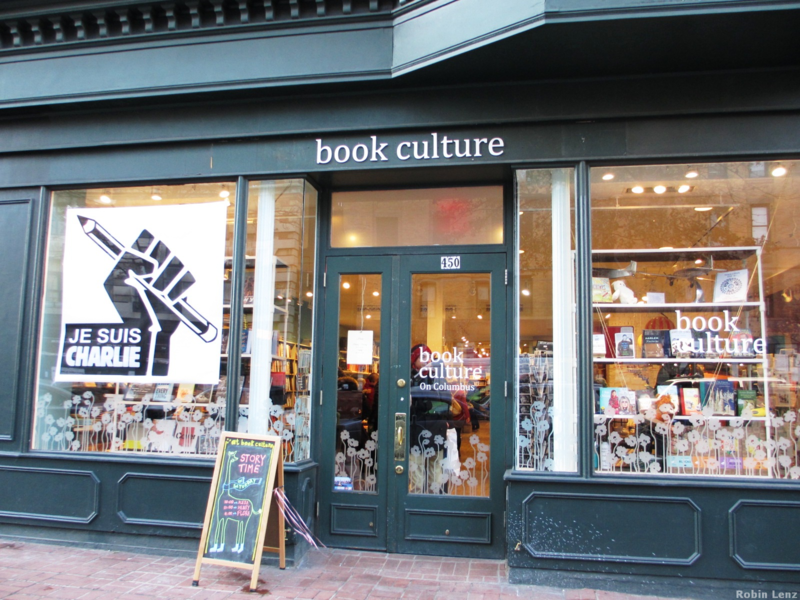 Book Culture on Manhattan's Upper West Side was one of the few stores in the U.S. to obtain early copies of the current issue of Charlie Hebdo. Through Uni-Presse, which markets French magazines and newspapers, the store received two copies on Friday; it framed one and allowed customers to browse through the other. On Sunday afternoon, the store announced on Twitter: "We just got 100 copies of#CharlieHebdo in at #BookCultureonColumbus--come pick up your copy pronto!" Two and a half hours later: "And that's a wrap! We are SOLD OUT!" 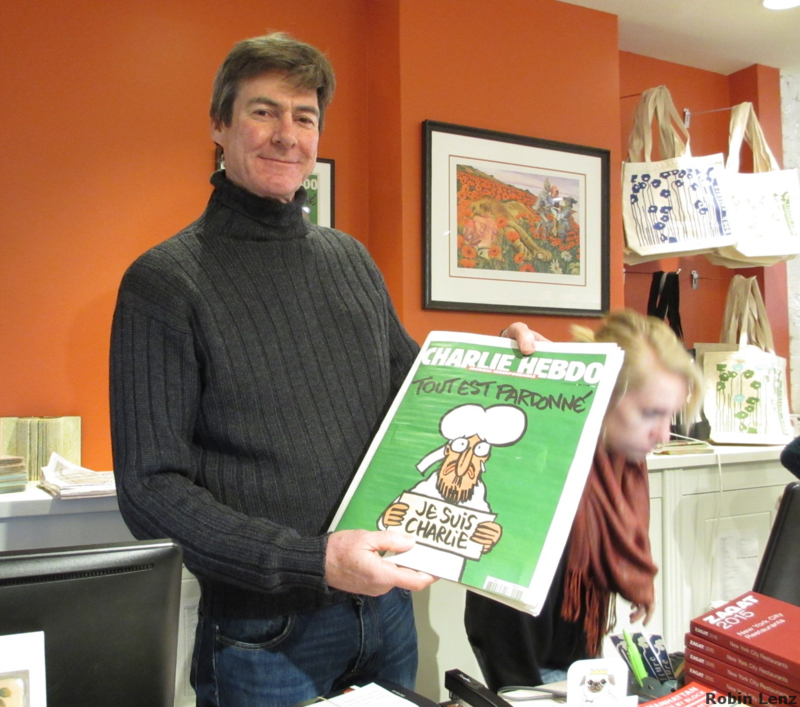 On the store's blog, owner Chris Doeblin (pictured above) wrote, "In answer to why we have put the posters in our window with Je Suis Charlie.... Je suis Charlie means we believe in democracy, human rights, the right to dialogue and the power of ideas and writing over violence and coercion. Je suis Charlie means that we will not review the content of our book shops to ensure we are not offending someone. Je suis Charlie means that as coworkers in the business of publishing and books we support, above the ideas themselves, the right of those ideas to be published. Je suis Charlie means that we're booksellers and it's a badge of honor." 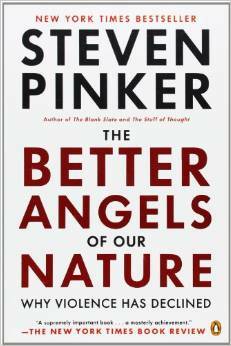 Facebook co-founder and CEO Mark Zuckerberg's second pick for his A Year of Books book club is The Better Angels of Our Nature: Why Violence Has Declined by Steven Pinker (Penguin), which he called "a timely book about how and why violence has steadily decreased throughout our history, and how we can continue this trend." He added: "A few people I trust have told me this is the best book they've ever read. It's a long book, so I plan on taking a month to read it rather than two weeks. I'll add a third book in two weeks that will be a shorter read to complement this." 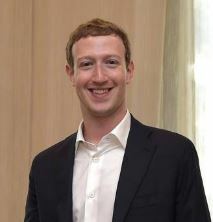 Zuckerberg announced A Year of Books on January 2, intending to read a book every other week this year and to discuss it on Facebook. The club's page has more than 270,000 likes. Zuckerberg's first pick, The End of Power by Moisés Naím (Basic Books), reportedly sold more e-book copies in the two days after the announcement of its selection than in the year and a half before. Kepler's Books, Menlo Park, a "cultural institution" that's celebrating its 60th year as a joint nonprofit/profit entity. Saqi Books, the U.K. publisher distributed in the U.S. by Consortium, is resuming English-language publishing and will release as many as 10 new titles a year. Publisher Lynn Gaspard said, "There has perhaps never been a greater need for critical, considered and progressive thinking from and about the Middle East. For over 30 years, Saqi has broadened access to important works written in Arabic and other languages, promoted awareness of cultural diversity in the U.K. and encouraged communication and debate between the Arab world and the West." This year Saqi will publish Desert Songs of the Night, an anthology of Arabic literature from pre-Islamic to modern times, and new and updated editions of Enemy on the Euphrates: The Battle for Iraq by Ian Rutledge, Syria: A Recent History by John McHugo and The People Want: A Radical Exploration of the Arab Uprising by Gilbert Achcar. For 2016, Saqi has acquired world English-language rights to About My Mother by Tahar Ben Jellouns, who has won the Prix Goncourt and the International IMPAC Dublin Literary Award. Stella Williams, who has been a bookseller and a manager in the children's book department at the Strand Book Store, New York City, will now be the store's dedicated children's book buyer and continue managing the second floor. She joined the Strand three and a half years ago. Frontlist book buyer Carson Moss commented: "I have no doubt she is going to bring her same ferocious dedication, knowledge and passion to the continuing evolution of our inventory. We've come a long way from a children's department tucked away in a funky corner of the basement. Stella's influence and curation will be another strong step forward." Sandee Roston has left Harper Children's Books after nine years with the company following the elimination of her position as executive director of publicity. She can be reached at sandee.roston@gmail.com. The Left Side of History: World War II and the Unfulfilled Promise of Communism in Eastern Europe by Kristen Ghodsee (Duke University Press). Today on the Diane Rehm Show: Mimi Sheraton, author of 1,000 Foods to Eat Before You Die: A Food Lover's Life List (Workman, $24.95, 9780761141686). She will also appear tomorrow on NPR's Here and Now. Today on Tavis Smiley: Jeffrey Sachs, author of The End of Poverty: Economic Possibilities for Our Time (Penguin, $18, 9780143036586). Tomorrow on the Diane Rehm Show: Sean McFate, author of The Modern Mercenary: Private Armies and What They Mean for World Order (Oxford University Press, $29.95, 9780199360109). The National Book Critics Circle has announced 30 finalists in six categories--autobiography, biography, criticism, fiction, general nonfiction and poetry--for the best books of 2014. The awards will be presented March 12 in New York City. Toni Morrison has won the Ivan Sandrof Lifetime Achievement Award. She was cited in part this way: "As a frequent public spokesperson for freedom of expression, the power of the written word, and the role of the artist, Toni Morrison has articulated a vision of the role of the writer that is both courageous and inspiring." Phil Klay's story collection, Redeployment (Penguin Press), has won the John Leonard Prize, established last year to recognize "outstanding first books in any genre." Alexandra Schwartz, an assistant editor at the New Yorker and a regular contributor to the magazine's website whose writing has appeared in the Nation, the New York Times and the New Republic, has won the 2014 Nona Balakian Citation for Excellence in Reviewing. 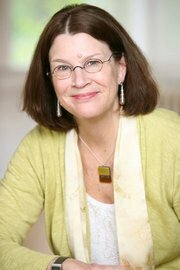 Mary François Rockcastle, director of the Creative Writing Programs at Hamline University, has won the Kay Sexton Award, sponsored by Common Good Books, St. Paul, Minn., honoring the longtime B. Dalton Bookseller bookseller and recognizing an individual or organization for "long-standing dedication and outstanding work in fostering books, reading, and literary activity in Minnesota." During Rockcastle's tenure at Hamline, the university has created an MFA in Creative Writing, an MFA in Writing for Children and Young Adults and a BFA in Creative Writing program. Rockcastle is the author of two novels published by Graywolf Press, Rainy Lake and In Caddis Wood. Author Kate DiCamillo, National Ambassador for Young People's Literature, commented: "Mary has made the Twin Cities a hub for children's literature, a destination for students and teachers and writers of books for children. There are only a handful of academic programs in the U.S. that are dedicated to literature for children and Mary Rockcastle has--to the Twin Cities' great benefit--created one here." Rockcastle will be honored on Saturday, April 18, at the 27th annual Minnesota Book Awards Gala in St. Paul. There's Something I Want You to Do is another characteristically elegant collection of 10 short stories from National Book Award nominee Charles Baxter (Gryphon; The Feast of Love). Organized symmetrically into two parts--the first stories bear the labels of classic virtues ("Forbearance" and "Charity") and the second have titles that evoke some of the seven deadly sins ("Avarice" and "Gluttony")--the stories weave together ingeniously through the device of recurring characters whose strengths (or more often weaknesses) become clear only over the course of two or three tales. Despite brief departures for more exotic settings like Tuscany and Prague, the action of most of the stories takes place in Minneapolis, where Baxter teaches creative writing and literature. In the first story, "Bravery," he introduces Elijah Jones, a pediatrician whose rejection by his wife when he tries to feed their newborn son drives him out of the house, where he performs a courageous rescue. But Dr. Jones's halo is tarnished in "Gluttony," when his inability to control a voracious appetite impels him to resort to a dubious weight-loss program. Dr. Jones's friend, architect Benny Takemitsu, likewise appears in several stories, from "Chastity," in which he carries out his own act of rescue, to "Lust," the account of his attempt to gamble away his life savings out of desperation over the end of a relationship. The most evocative linkage involves a minor character in "Loyalty" who assumes the role of narrator in "Avarice," when the return of her former daughter-in-law (whose departure was the centerpiece of the earlier story) becomes the instrument for the working out of what she perceives as a divine plan. Baxter's precise, economical style, demonstrated in his skill for characterization, heightens the pleasure of these stories. The narrator of "Loyalty" describes how his teenage son "looks past me as if I were a footnote." A female character in "Chastity" has a posture "like an apology of sorts for her prettiness." Elijah Jones's wife accuses him of acting like an "oscillating fan" when he sets out to discipline their son: "Wisdom spews out of you in all directions," she says. Shelf Talker: Focusing on virtues and vices, Charles Baxter's new collection of 10 stories illuminates a broad spectrum of human behavior among a small group of Minneapolis residents.